Ignition Cylinder Information – Welcome to the EMIT Technical Forum! Note: This screen was superseded in EIM version 2.00. See the page "New Ignition Cylinder Information" for the page(s) on 2.00 and newer. The Cylinder Information screen (Pg. 440) presents ignition information in bar graph form and provides access to additional individual cylinder information. It is accessed by selecting the spark bar graphs on the Ignition Home Screen. The following information can be visually compared through the bar graphs, and can be changed by clicking on the data item above the bar graph and selecting a different data item. The current average is highlighted and an average bar is shown for that data value. “Misfires” – Displays accumulated misfires for each cylinder. If in Engineering access mode, this value can be cleared. If a bar graph background flashes yellow, then a misfire occurred on that cylinder. If this happens frequently on a given cylinder, the spark plug and coil should be checked. The Spark Graph screen (Pg. 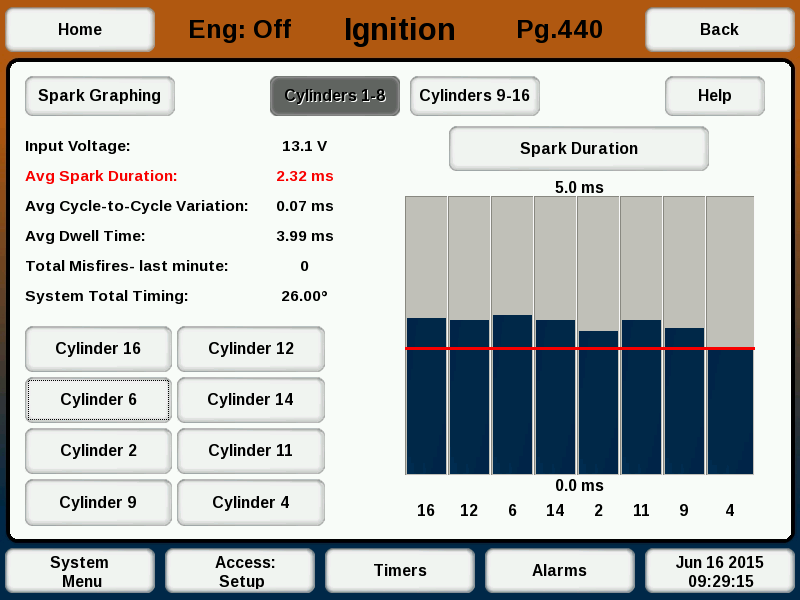 448) is accessed by selecting the “Spark Graphing” button from the Cylinder Information screen (Pg. 440). 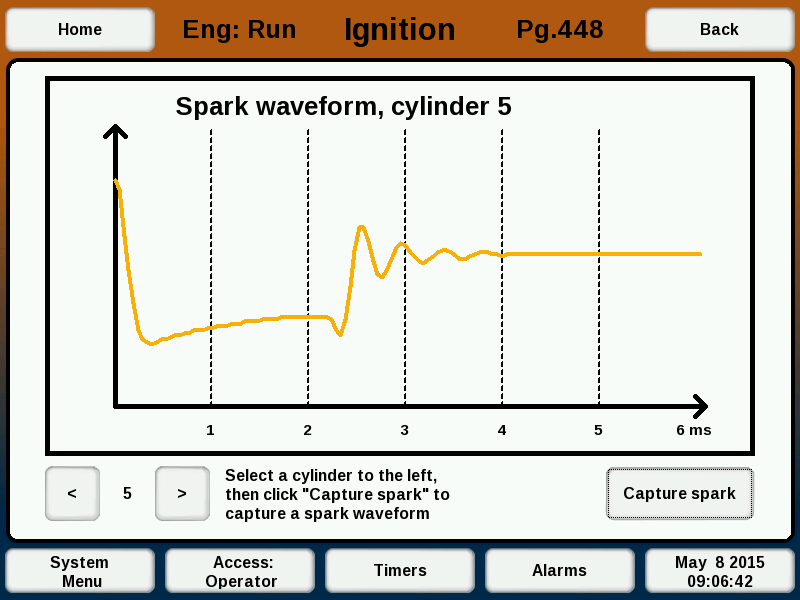 To graph a spark waveform, select the cylinder to capture and press the “Capture Spark” button. A healthy spark should be drawn as shown below. Unhealthy sparks will be abnormally short/long or have intermittent jogs within the low duration of the spark. The Individual Cylinder Information screen (Pg. 442) presents comparison data for the particular cylinder selected from the Cylinder Information screen (Pg. 440). 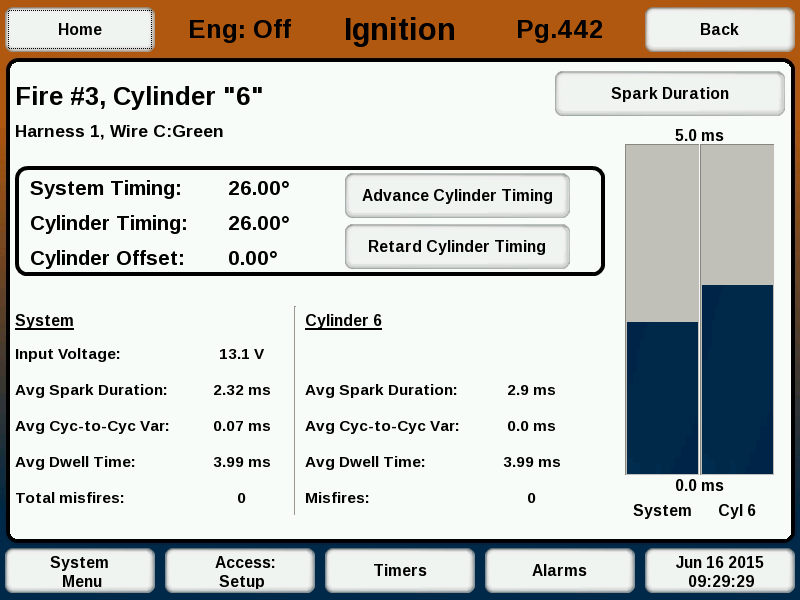 The data displayed compares various information from the cylinder to the engine average. Data is displayed in table form as well as graphically through bar graphs. Individual cylinder timing is adjustable from this screen. Selecting the “Advance Cylinder Timing” and “Retard Cylinder Timing” buttons adjusts the offset from the Total Timing of the system. Timing offsets are in increments of 0.25°. Security access of Setup or Engineering is required to adjust the timing.